Illegitimate joining of chromosome breaks can lead to the formation of chromosome translocations, a catastrophic type of genome rearrangements that often plays key roles in tumorigenesis. Emerging evidence suggests that the mobility of broken DNA loci can be an important determinant in partner search and clustering of individual breaks, events that can influence translocation frequency. 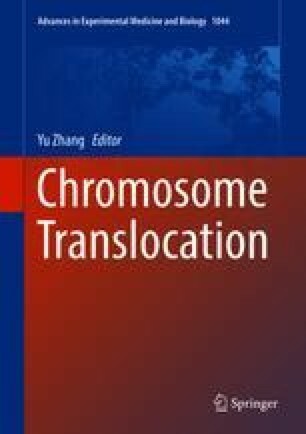 We summarize here the recent literature on the mechanisms that regulate chromatin movement, focusing on studies exploring the motion properties of double-strand breaks in the context of chromatin, the functional consequences for DNA repair, and the formation of chromosome fusions. Authors Henrike Johanna Gothe and Vera Minneker have equally contributed to this chapter. We would like to apologize to colleagues whose work could not be cited due to space limitations. We would like to thank Dr. Karen Meaburn for critical reading of the manuscript. This work is supported by the “DFG Major Research Instrumentation Programme” (INST 247/845-1 FUGG).